You know it’s a crazy endurance race when a slower class of car is leading the race and in with a remote shot of winning. And that’s exactly what happened at this past weekend’s Le Mans 24 Hours. But it was not to be, as the #2 Porsche car took the chequered flag in first. It was looking like Toyota would finally break their duck this weekend, after the heartache of last year’s event. In fact, qualifying saw Kamui Kobayashi’s Toyota break the all-time lap record by roughly two seconds. And the race initially saw the Toyotas streak ahead, leaving the Porsches in the dust. However, disaster would strike for the Toyotas in the overnight running, as a collision and clutch issue would force two of them out. The third Toyota was way down in the doldrums, having experienced a lengthy stop due to mechanical troubles — it would eventually finish just inside the overall top ten. The Porsches weren’t immune to issues either, with the four hour mark seeing the #2 Porsche of Brendon Hartley, Timo Bernhard and Earl Bamber come into the pits with power unit issues. The car would sit in the pits for well over an hour, eventually emerging well past 50th place. Once daylight broke again, it was the number one Porsche of Andre Lotterer, Neel Jani and Nick Tandy that had a handy lead. But this too was not to be, as a power unit issue saw the car coast and eventually stop barely halfway around the circuit. The high attrition rate meant that the slower JOTA/Jackie Chan Racing DC LMP2 car (driven by Ho Pin Tung, Thomas Laurent and Oliver Jarvis) found itself in the lead, with several laps on the #2 Porsche and roughly three hours to go. 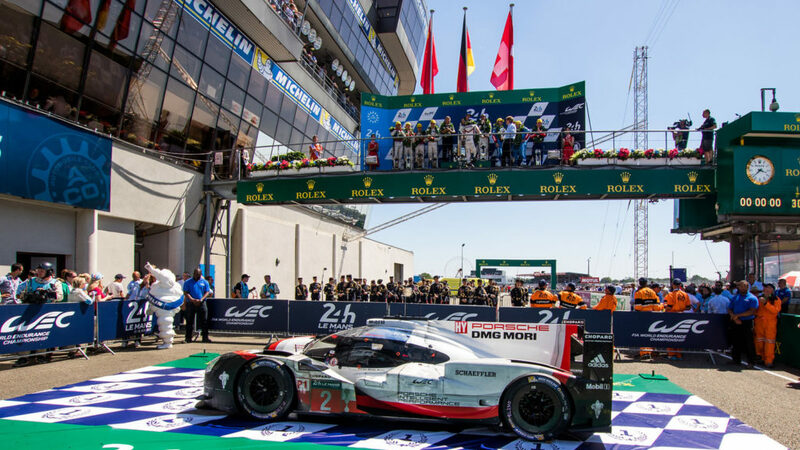 However, the Porsche would regularly lap at least 10 seconds faster than the LMP2 car, eventually retaking the lead with just over an hour to go. The running order would stay this way, delivering a hat-trick of wins for Porsche and seeing two LMP2 cars on the overall podium. Meanwhile, the GTE Pro category went down to the last lap, with the Aston Martin of Jonny Adam, Darren Turner and Daniel Sera dicing with the Corvette of Jan Magnussen, Antonio Garcia and Jordan Taylor. The Corvette would suffer a puncture as they started the final lap, having run wide, leaving the Aston Martin to win.